The Satanic Temple is a growing organization with charter groups in a number of major cities across America. It styles itself as a ‘religious movement’ but is nothing of the sort unless you consider atheism a religion and it should not be confused with other groups which actually worship Satan. 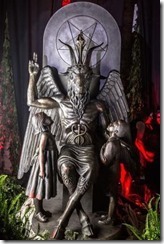 In reality this is nothing more than an atheist activist group which does not even believe in the reality of the Devil but uses the symbols of Satan and the trappings of religion to oppose Christians, Christian beliefs, Christian organizations, and the American church in any way possible. …these Satanists identify as justice-oriented atheists, using the symbol of Satan not just as parody but also to challenge religious groups that use the mantle of God to justify their actions. 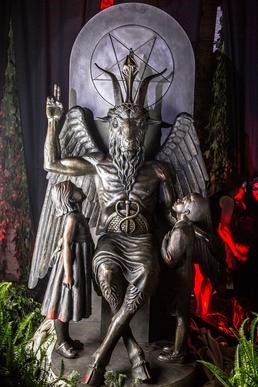 At a time when religious advocates hold tremendous power in the White House, the Satanic Temple’s mission may become more important than ever — if its would-be supporters can get past all the demonic imagery. Response: If you read the Wikipedia article about The Satanic Temple, what this group is all about becomes much clearer. This is an activist atheist group that opposes any public displays of religion by demanding equal time for their ‘Satanic’ prayers, symbols, teaching, and school clubs.